(A) A reissue applicant must acknowledge the existence of an error in the specification, drawings, or claims, which error causes the original patent to be defective. In re Wilder, 736 F.2d 1516, 222 USPQ 369 (Fed. Cir. 1984). A change or departure from the original specification or claims represents an “error” in the original patent under 35 U.S.C. 251. See MPEP § 1402 for a discussion of grounds for filing a reissue that may constitute the “error” required by 35 U.S.C. 251. Not all changes with respect to the patent constitute the “error” required by 35 U.S.C. 251. It is noted that an error to be corrected under 35 U.S.C. 251 may be the addition of a claim or claims that is/are narrower in scope than the existing patent claims, without any narrowing of the existing patent claims. See In re Tanaka, 640 F.3d 1246, 1251, 98 USPQ2d 1331, 1334 (Fed. Cir. 2011). Where more than one error is specified in the oath/declaration and some of the designated “errors” are found to not be “errors” under 35 U.S.C. 251, any remaining error which is an error under 35 U.S.C. 251 will still support the reissue. The “at least one error” which is relied upon to support the reissue application must be set forth in the oath/declaration. It is not necessary, however, to point out how (or when) the error arose or occurred. Further, it is not necessary to point out how (or when) the error was discovered. If an applicant chooses to point out these matters, the statements directed to these matters will not be reviewed by the examiner, and the applicant should be so informed in the next Office action. What is needed for the oath/declaration statement as to error is the identification of “at least one error” relied upon. 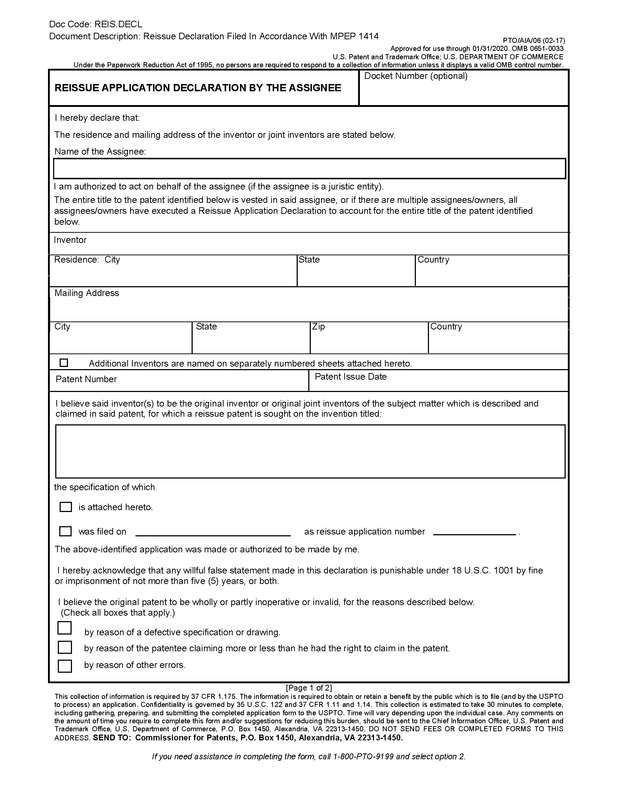 For an application filed on or after September 16, 2012 that seeks to enlarge the scope of the claims of the patent, the reissue oath or declaration must also identify a claim that the application seeks to broaden. A general statement, e.g., that all claims are broadened, is not sufficient to satisfy this requirement. In identifying the error, it is sufficient that the reissue oath/declaration identify a single word, phrase, or expression in the specification or in an original claim, and how it renders the original patent wholly or partly inoperative or invalid. The corresponding corrective action which has been taken to correct the original patent need not be identified in the oath/declaration. 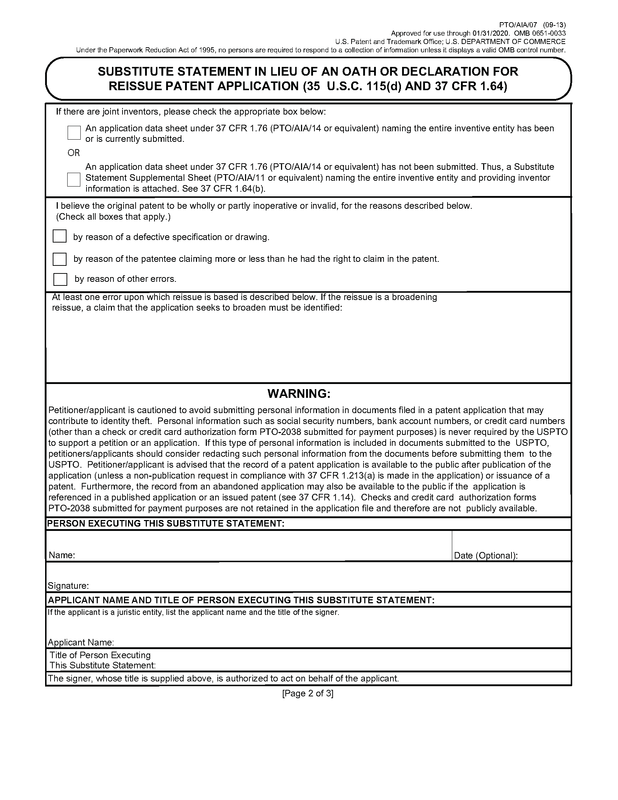 If the initial reissue oath/declaration “states at least one error” in the original patent, and, in addition, recites the specific corrective action taken in the reissue application, the oath/declaration would be considered acceptable, even though the corrective action statement is not required. (C) It is not sufficient for an oath/declaration to merely state “this application is being filed to correct errors in the patent which may be noted from the changes made in the disclosure.” Rather, the oath/declaration must specifically identify an error. In addition, it is not sufficient to merely reproduce the claims with brackets and underlining and state that such will identify the error. See In re Constant, 827 F.2d 728, 729, 3 USPQ2d 1479 (Fed. Cir. ), cert. denied, 484 U.S. 894 (1987). Any error in the claims must be identified by reference to the specific claim(s) and the specific claim language wherein lies the error. Where the reissue oath/declaration does identify an error or errors, the oath/declaration must be checked carefully to ensure that at least one of the errors identified is indeed an “error” which will support the filing of a reissue, i.e., an “error” that will provide grounds for reissue of the patent. See MPEP § 1402. If the error identified in the oath/declaration is not an appropriate error upon which a reissue can be based, then the oath/declaration must be indicated to be defective in the examiner’s Office action. 2. 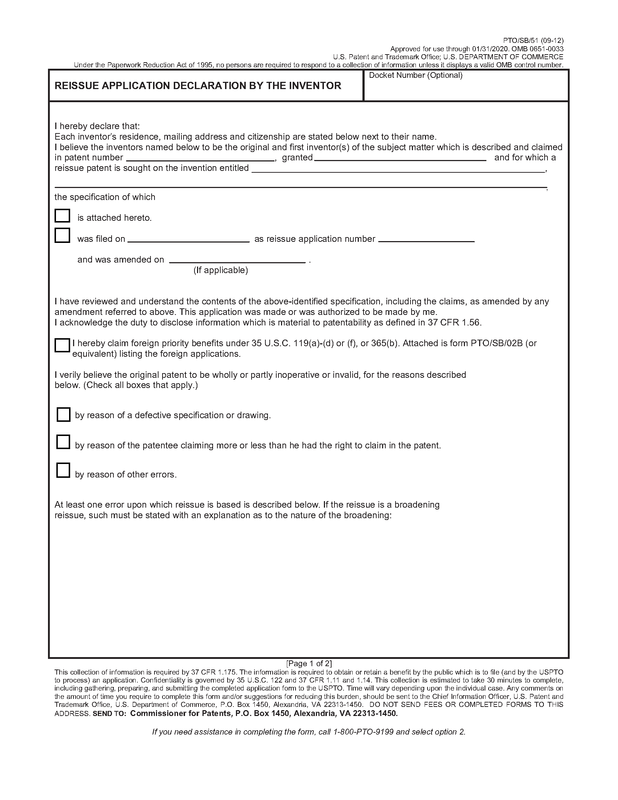 Note that if the reissue oath/declaration identifies more than one error relied upon, and at least one of the errors is an error upon which reissue can be based, this form paragraph should not be used, despite the additional reliance by applicant on “errors” which do not support the reissue. Only one appropriate error is needed to support a reissue. 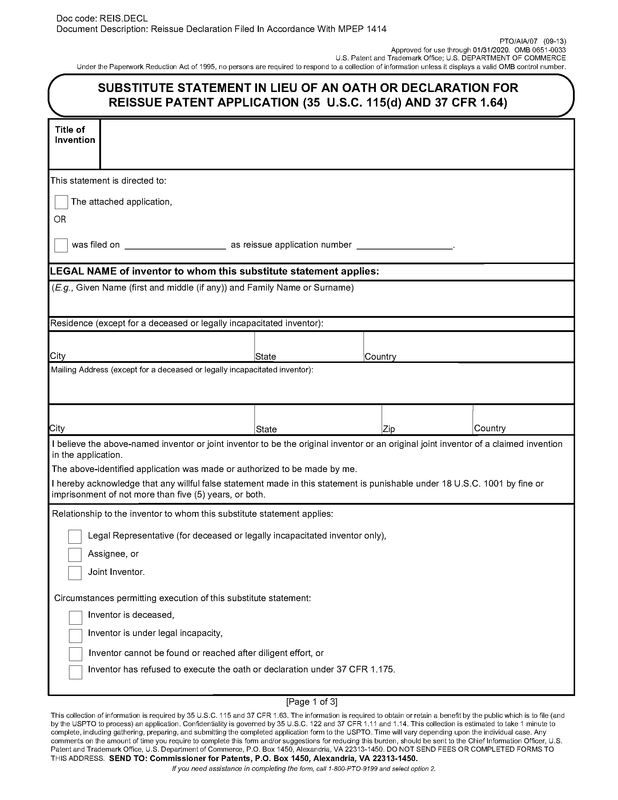 37 CFR 1.175 Inventor's oath or declaration for a reissue application. Depending on the circumstances, the inventor’s oath or declaration for a reissue application can be (a) a reissue declaration by the inventor, (b) an assignment by the inventor containing the statements required by 37 CFR 1.63 and 1.175 (“assignment-statement”), (c) a reissue declaration by the assignee, or (d) a substitute statement by the patentee, or the current patent owner if there has been an assignment. Depending on the circumstances, form PTO/AIA/05, Reissue Application Declaration By The Inventor, form PTO/AIA/06, Reissue Application Declaration By The Assignee, or form PTO/AIA/07, Substitute Statement in Lieu of an Oath or Declaration for Reissue Patent Application (35 U.S.C. 115(d) and 37 CFR 1.64), may be used to prepare a declaration in a reissue application. Pre-AIA 37 CFR 1.175 Reissue oath or declaration. 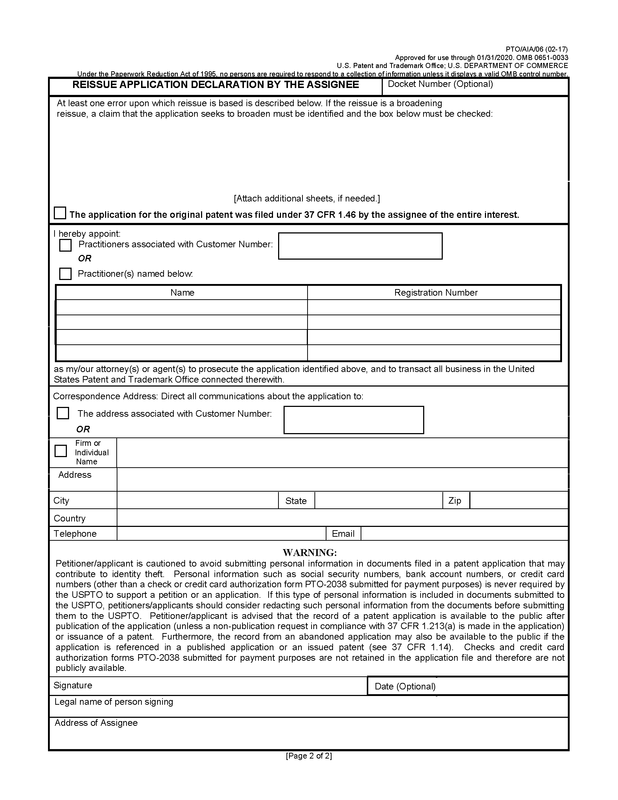 Pursuant to 37 CFR 1.67(a), the applicant may submit an inventor's oath or declaration meeting the requirements of 37 CFR 1.63, 1.64, or 1.162 to correct any deficiencies or inaccuracies present in an earlier-filed inventor's oath or declaration. 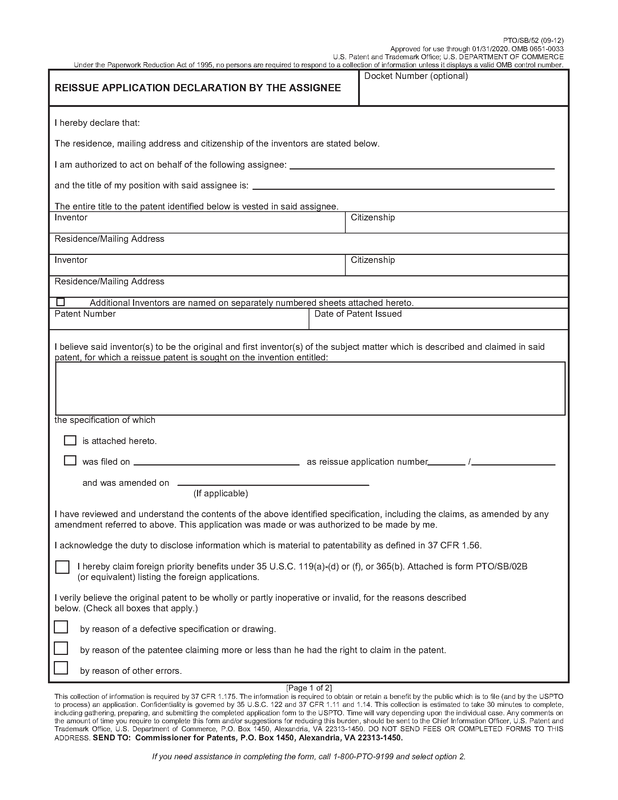 For applications filed on or after September 16, 2012, if additional defects or errors are corrected in the reissue after the filing of the reissue oath or declaration, a supplemental reissue oath or declaration is not required. However, where all errors previously identified in the reissue oath/declaration are no longer being relied upon as the basis for reissue, the applicant must explicitly identify on the record an error being relied upon as the basis for reissue (e.g., in the remarks accompanying an amendment). See 37 CFR 1.175(d). 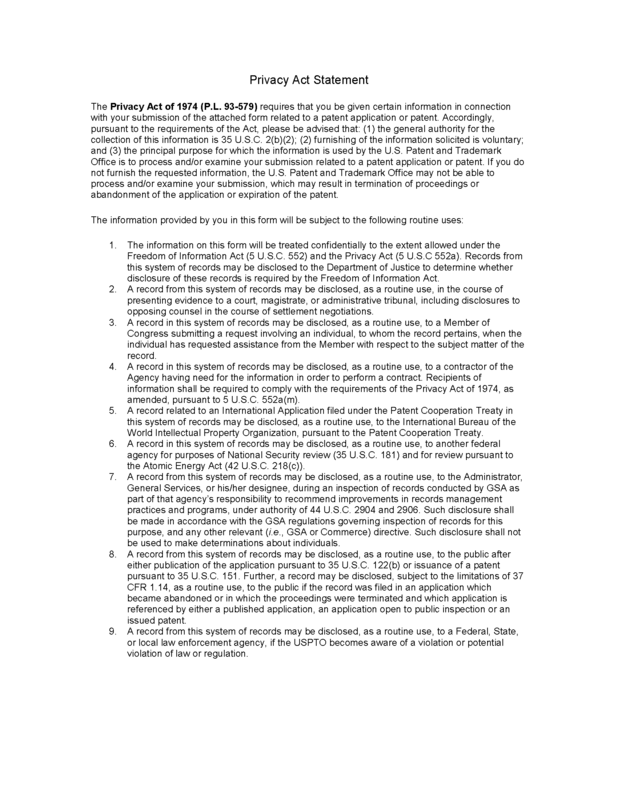 Identification of the error must be conspicuous and clear, and must comply with 35 U.S.C. 251. 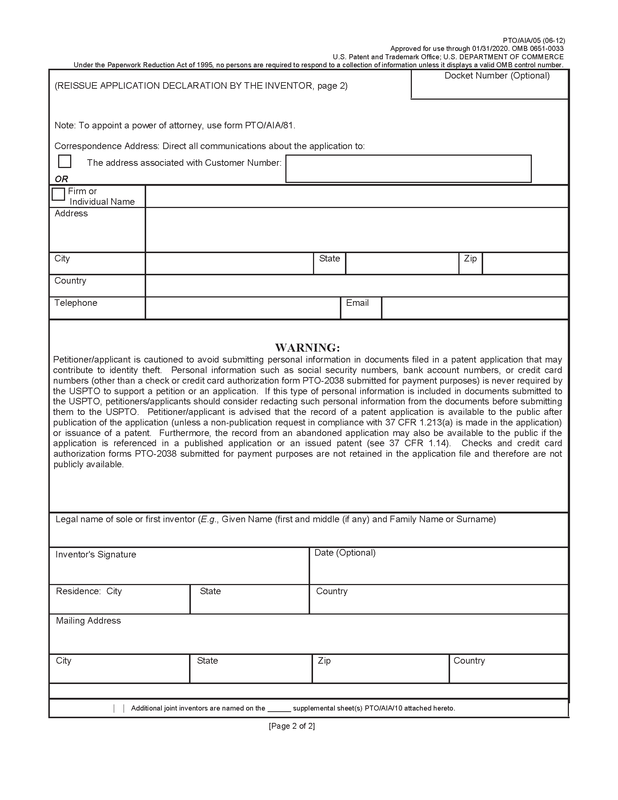 For applications filed before September 16, 2012, if additional defects or errors are corrected in the reissue after the filing of the application and the original reissue oath or declaration, a supplemental reissue oath/declaration must be filed, unless all additional errors corrected are spelling, grammar, typographical, editorial or clerical errors which are not errors under pre-AIA 35 U.S.C. 251 (see MPEP § 1402). In other words, a supplemental oath/declaration is required where any “error” under pre-AIA 35 U.S.C. 251 has been previously corrected, or is being corrected at the time the supplemental reissue oath/declaration is submitted, and the error was not covered by a previously filed reissue oath/declaration. The supplemental reissue oath/declaration must state that every error which was corrected in the reissue application not covered by the prior oath(s)/declaration(s) submitted in the application arose without any deceptive intention on the part of the applicant. "Every error in the patent which was corrected in the present reissue application, and is not covered by the prior declaration submitted in this application, arose without any deceptive intention on the part of the applicant." A supplemental reissue oath/declaration will not be effective for any errors which are corrected by a filing made after the execution of the supplemental reissue oath/declaration, unless it is clear from the record that the parties executing the document were aware of the nature of the correction when they executed the document. Further, a supplemental reissue oath/declaration with an early date of execution cannot be filed after a correction made later in time, to cover the correction made after the execution date. This is so, even if the supplemental reissue oath/declaration states that all errors up to the filing of the supplemental reissue oath/declaration oath or declaration arose without any deceptive intention on the part of the applicant. Form PTO/SB/51S, “Supplemental Declaration For Reissue Patent Application To Correct ‘Errors’ Statement (37 CFR 1.175),” may be used to prepare a supplemental reissue declaration. Form PTO/SB/51S serves to indicate that every error in the patent that was corrected in the reissue application, but was not covered by a prior reissue oath/declaration submitted in the reissue application, arose without any deceptive intention on the part of the applicant. 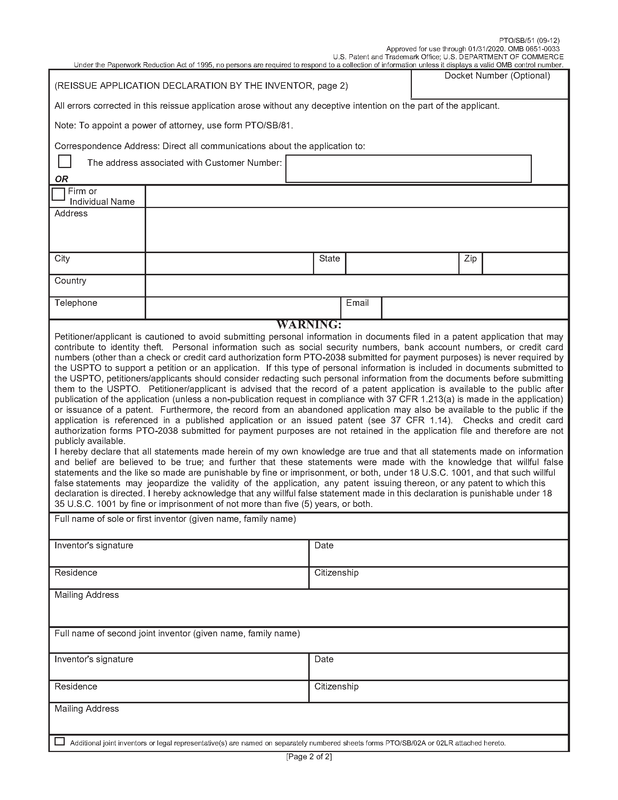 In the event that the applicant for a reissue application is required to file a supplemental reissue oath/declaration that also includes a specific statement of the error being corrected by reissue in accordance with pre-AIA 37 CFR 1.175(c), as discussed in subsection A. below, applicant must also include in the supplemental declaration language equivalent to the “Every error …” language in the example of acceptable language set forth above. 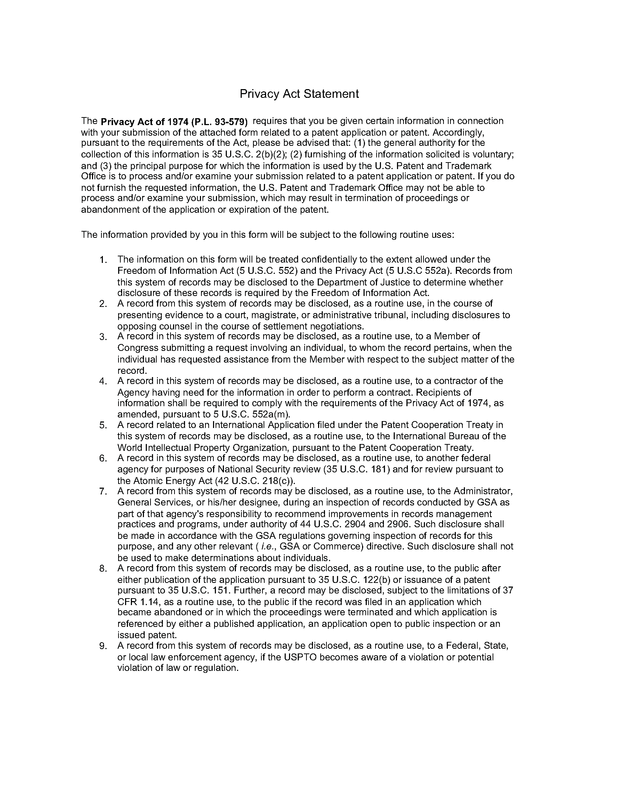 Therefore, if either form PTO/SB/51, “Reissue Application Declaration By The Inventor,” or form PTO/SB/52, “Declaration By The Assignee” (see MPEP § 1414) is used for the purpose of filing such supplemental reissue oath/declaration, the form must be completed so that it is clear that the supplemental reissue oath/declaration addresses all errors corrected subsequent to the date upon which the last previous reissue oath/declaration (whether original or supplemental) was filed. 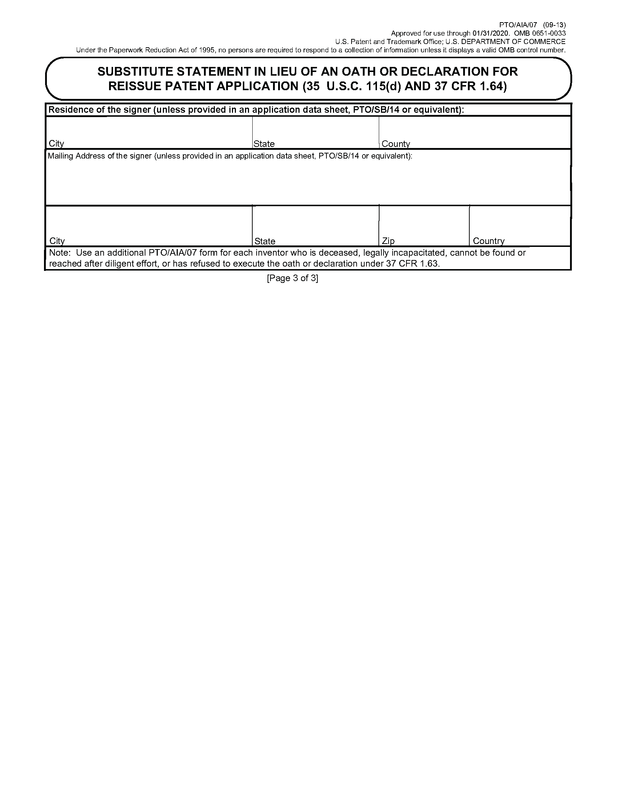 For example, the form could be completed by specifying the date upon which the reissue application was originally filed, the reissue application number, and the date(s) of every amendment filed subsequent to the date upon which the last reissue oath/declaration (whether original or supplemental) was filed. Any manner of completing the form so that affiant/declarant unambiguously states that every error corrected subsequent to the filing of the last filed reissue oath/declaration (whether original or supplemental) arose without deceptive intent will be acceptable. It will not be acceptable for a newly filed supplemental oath/declaration to simply refer to the reissue application as filed, even though the new oath/declaration may be submitted after an amendment. (B) that error is still being corrected in the reissue application. If applicant chooses to state any further error at this point (even though such is not needed), the examiner should not review the statement of the further error. (C) all errors under pre-AIA 35 U.S.C. 251 stated in the prior reissue oath(s)/declaration(s) are no longer being corrected in the reissue application. The supplemental oath/declaration in accordance with pre-AIA 37 CFR 1.175(b)(1) must be submitted before allowance. See MPEP § 1444 for a discussion of the action to be taken by the examiner to obtain the supplemental oath/declaration in accordance with pre-AIA 37 CFR 1.175(b)(1), where such is needed. Where applicant seeks to correct an error after allowance of the reissue application, a supplemental reissue oath/declaration must accompany the requested correction stating that the error(s) to be corrected arose without any deceptive intention on the part of the applicant. The supplemental reissue oath/declaration submitted after allowance will be directed to the error applicant seeks to correct after allowance. This supplemental oath/declaration need not cover any earlier errors, because all earlier errors should have been covered by a reissue oath/declaration submitted before allowance. A broadening reissue application must be applied for by all of the inventors (patentees), that is, the original reissue oath/declaration must be signed by all of the inventors. See MPEP § 1414. If a supplemental oath/declaration in a broadening reissue application is subsequently needed in the application in order to fulfill the requirements of pre-AIA 37 CFR 1.175, the supplemental reissue oath/declaration must be signed by all of the inventors. In re Hayes, 53 USPQ2d 1222, 1224 (Comm’r Pat. 1999) (“37 CFR 1.175(b)(1), taken in conjunction with Section 1.172, requires a supplemental declaration be signed by all of the inventors. This is because all oaths or declarations necessary to fulfill the rule requirements in a reissue application are taken together collectively as a single oath or declaration. Thus, each oath and declaration must bear the appropriate signatures of all the inventors.”). 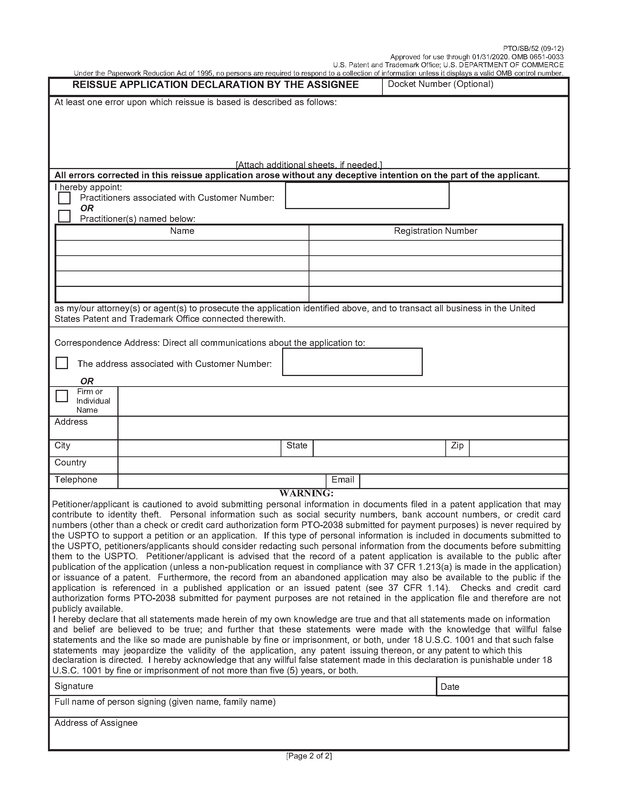 If a joint inventor refuses or cannot be found or reached to sign a supplemental oath/declaration, a supplemental oath/declaration listing all the inventors, and signed by all the available inventors may be filed provided it is accompanied by a petition under 37 CFR 1.183, along with the petition fee, requesting waiver of the signature requirement of the nonsigning inventor. 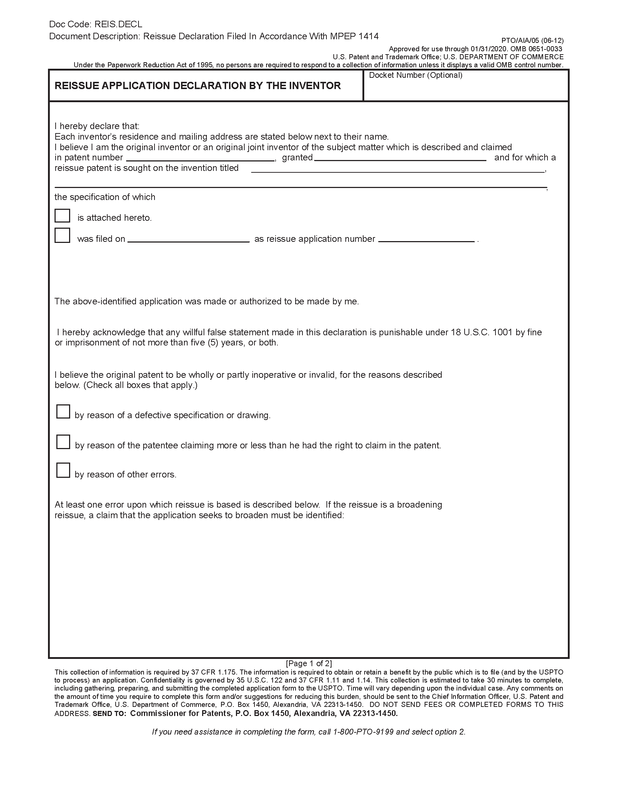 If a sole inventor refuses or cannot be found or reached to sign a supplemental oath/declaration, a supplemental oath/declaration listing the sole inventor, and signed by the assignee or a party who otherwise shows sufficient proprietary interest in the matter justifying such action may be filed provided it is accompanied by a grantable petition under 37 CFR 1.183, along with the petition fee, requesting waiver of the signature requirement of the nonsigning inventor.